The Tomb of Jahangir is a mausoleum built for the Mughal Emperor Jahangir. The mausoleum dates from 1637, and is located in Shahdara Bagh in Lahore, Punjab, Pakistan, along the banks of the Ravi River. While the tomb's exterior is restrained, the site is famous for its interiors that are extensively embellished with frescoes and marble. 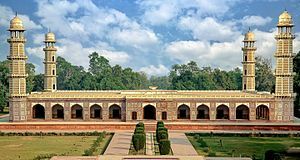 This article uses material from the Wikipedia article "Tomb of Jahangir", which is released under the Creative Commons Attribution-Share-Alike 3.0 License.